German immigrant who built an empire installing car sunroofs. The American Sunroof Company grew into a conglomerate with 5,300 employees spread over 60 facilities worldwide. 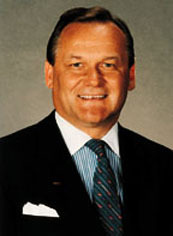 Prechter was an important fundraiser for the Republican Party; he earned the rank of Pioneer by raising $335,775 for Texas governor George W. Bush in 1999-2000. After the man hanged himself in 2001, President Bush issued a press release stating "Laura and I were saddened to hear of the death of Heinz Prechter. He will be missed. He was a great friend of ours as well as the entire Bush family. He was an honorable and loyal man. Our thoughts and prayers are with his family during this very difficult time."